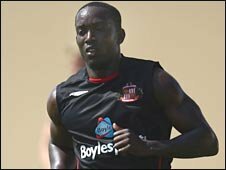 Ex-Manchester United and Aston Villa striker Dwight Yorke has announced his retirement from football, aged 37. Yorke, who was released by Sunderland at the end of last season, won the Champions League with United in 1999. He also won three successive Premiership titles and captained Trinidad and Tobago at the 2006 World Cup in Germany. "I hope people will say that I played the game in the right way with a smile on my face," he said. "While I'm still in great shape, I'm not getting any younger and I've had the time of my life. "I've been blessed really. I've played alongside some of the greatest players the Premier League has ever seen in Roy Keane, Paul Scholes, Ryan Giggs, David Beckham, Peter Schmeichel, and played for the greatest manager in Sir Alex Ferguson. "I'll always count myself lucky. I was a boy on a beach from a little Caribbean island that got the chance to fulfil his dream of winning trophies at the highest level and captaining his country in their first ever World Cup finals." Yorke played 480 club games and scored 147 goals, scoring 64 in 151 appearances for United. Yorke then moved to Blackburn in 2002 for £2m before moving to Birmingham in 2004. He also played for Sydney FC before switching to Sunderland in 2006. Yorke has accepted a position as assistant manager of the Trinidad and Tobago national team for the rest of the World Cup qualifiers and says that he hopes to build up his experience and one day manage a team in England.